Beach bottle favors can be used as table decoration and also as beach favors. 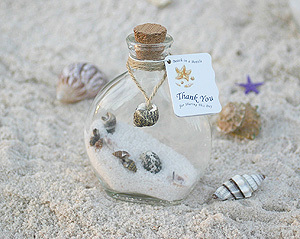 The beach bottle favors can also be used as invitations. Beach bottle favors are perfect for destination weddings and pool parties also. Make sure that you visit all of beach themed wedding favors sections. 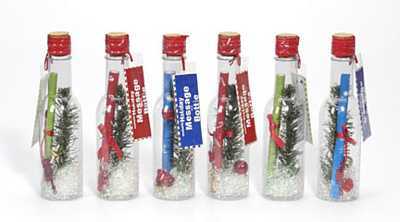 These cute message in a bottles have a holiday theme. They are plastic and ~5.5"tall. They come with holiday paper to write your message on. Just take the tape off of the bottle, take the paper out and write your message, reroll, place back in the bottle, put the tape back on and mail! Or if you are short on time and have a lot messages to write, just use your own paper and use a computer generated message. That way, you just have to make multiple copies. These bottles can be mailed. The holiday message in a bottle are great for holiday "cards", holiday invitations, or a beach wedding during the holidays. Great idea. Price is per holiday message in a bottle. Must order in increments of 6. These 6.5" plastic or glass "message in a bottle" bottles are great for invitations and beach wedding favors. You can create your own little beach with sand, shells and other beach novelties in these bottles. Price does include cork. You can mail these bottles in the mail! Just add a label and stamp (extra postage required). We have white box mailers if you prefer a box. We also have colored sand. Price is per set of 12 empty bottles with corks. The colored sand is a great accent for your "message in a bottle" bottles. The colored sand will make your invitations or beach wedding favors very unique. The sand is also great for beach weddings decorations. 1 pound of sand will fill about 30 of our "message in a bottle" bottles 1/2" high. Price is per pound. 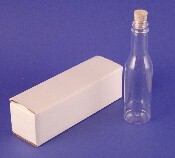 These white box mailers are the perfect fit for your "message in a bottle" bottle. The mailers are 7" x 2" x 2" Price is per set of 12. 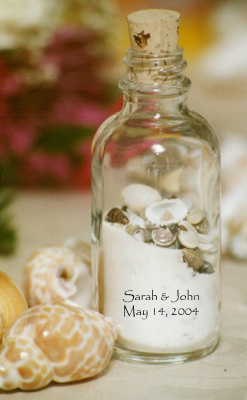 Personalized Sand & Shell Bottle Personalized seashell bottles are for your seaside or beach-themed wedding, give guests a lasting memento to take home with them. With pure white sand and a colorful assortment of tiny shells, these seashell bottles can be personalized with transparent stickers printed with the bride's and groom's names and wedding date in a script font. Stickers come separately so they can be placed wherever you wish. Great beach wedding favor. Bottle measures 3 1/2" tall; includes cork top. Allow 5 business days to ship. Minimum order 1 set of 12 bottles. Price is per set of 12 personalized seashell bottles. Only 2 lines of text, 20 characters per line.